Fill up the cup and listen to Krissy Kendall, Ph.D. tell us everything we should know about the world's most popular drug. Are you trying to match your caffeine intake to your physique or training goals? Here's what you need to know! Episode 16: All About Caffeine - What Every Lifter Needs to Know. Fill up the cup and listen to Krissy Kendall, Ph.D. tell us everything we should know about the world's most popular drug. Are you trying to match your caffeine intake to your physique or training goals? Here's what you need to know! What happens in your body when you ingest caffeine, and how soon the effects "peak"
Caffeine primes your body to use fat as fuel? It's true! If you're a light responder, is caffeine still damaging your sleep? The "upper limit" for performance boosting is… really high! But doesn't it dehydrate you? Not really. How much caffeine is in your coffee? Good question. Why decaf is anything but. Does adding milk to coffee affect the caffeine content? What is the ideal spacing of caffeine doses? Can caffeine keep you from adding muscle? Are the health benefits of caffeinated coffee better than decaf? Nick Collias:	Hi everyone, Nick Collias here. I'm an editor for Bodybuilding.com. And I've got my caffeinated cohort, Krissy Kendall, by my side, science editor for Bodybuilding.com. And today we're talking all about caffeine. Krissy has not only studied caffeine, she has also taken enough of it to kill a blue whale. That's this morning alone. Dr. Krissy Kendall:	Is that in reference to your shirt? The blue whale? Nick:	Hey, there's no cameras here, we don't need to talk about my shirt. Leave the shirt out of it. Anyway, Krissy is as they say, hopped up on goofball this morning. Krissy:	Oh, is that what the kids are calling it? Nick:	What have you had, in terms of stimulants, this morning? Krissy:	I'm on my third cup. Third cup of coffee. Nick:	Mm-hmm (affirmative). Is that how it works? It's like three to four cups a day? Krissy:	So, yeah, depends if I work out. If I work out in the morning, then I will have a pre-workout which the one I use has about 200 milligrams of caffeine. Then I have, usually, two cups of coffee, morning and then mid-morning. And then I have a Monster, either white or blue. Those are the only two that I have. Nick:	Oh, there's a plan here. Nick:	Depending on where you get it. If you make it yourself, that's one thing. Nick:	Arugula. Arugula is the secret caffeine. Nick:	I don't know if that's actually true, I just heard that recently. Krissy:	Well, there is, yeah. Surprising. But most of the time, even chocolate, chocolate, people say chocolate's caffeine. Unless it's infused or the people put caffeine in it, it's not a huge ... Like 30 to 40 milligrams. Nick:	Yeah, that was something I wanted to talk about at some point and also the theobromine in it affects that, right? Krissy:	Yeah, yeah. That's my daily caffeine. Obviously, things change little bit day to day but for the average day, that's what I'm looking at. Nick:	For full disclosure, I guess I'll say what I do as well. Krissy:	Yeah, I'm interested to know. Nick:	I make a shot of espresso when I wake up. It is the first thing I do every morning before I even allow myself to take a breath outside the bed, I'm staggering toward the espresso machine. I make one beautiful little shot. It's the highlight of my entire day. That's also a ritual. The kids wake up every morning to the sound of the espresso machine warming up. It kind of goes ... I grind the beans and I hear my one year old, "Da, da!" And then the five year old goes, "Hey, da, da, mama!" And then that's how the day starts. I'll have usually one more, either a shot from someplace in downtown Boise on the way or a cup or two of tea here, or I'll sneak into the board room where we are recording this podcast and have a cup of coffee out of the executive coffee machine because at Bodybuilding.com, that is the best cartridge plate in the town. So anyway, my secret's out I guess. But it's a little more limited than you, but I think it's worth discussing these things also, because it's easy to talk about caffeine. Oh, caffeine it is this substance. But it isn't caffeine for nearly anybody, it's what you drink. It's coffee, it's tea, it's your amino fruity punch, or it's a tool for your workout. And I want to get into caffeine today, so we can have a little greater understanding, be a little more strategic about how we actually take it. Not only because every day is a good day to talk about caffeine, as people do every day in this office. But the world's most caffeinated coffee just got released the other day. Krissy:	And what is that? Nick:	That would be Black Insomnia, it's called. It's about 750 milligrams of caffeine per 12 ounce cup. You know, whatever, it's a total gimmick and I don't really want to dwell on it. Krissy:	Nor do I want to take it. Nick:	Yeah, exactly. And as fascinating as it is, I don't really want to dwell on the history of chemistry of caffeine either, that's something for somebody else's podcast. Krissy:	Well we have articles, you can look, read it on the Internet. Nick:	But let's talk about caffeine and actually what it does when you take it and how you can take advantage of that, what you should watch for. Caffeine, it is first and foremost a central nervous system stimulant. You hear that? Nick:	What does that mean for something to say central nervous system stimulant? What does that do to your body? Krissy:	It awakes you, it makes you alert. And that's, so ... And I'll try to stick on track with you and not go too far out, but we could really talk about a few things that caffeine does, and the main thing is its effect on the central nervous system. You just talked about it, that the first thing you do when you wake up is you make coffee, and that's what I do. I mean, I'm not gonna do much before I either take a pre-workout if I'm going to the gym or grab a cup of coffee because I need to wake up, I need to feel alert, I need some mental clarity so I can get myself to do something. And that's, I would say, 80% of what caffeine does, is its effect on the central nervous system. And I think that's why most people take it. Nick:	Right, and I feel like, just as I start the ritual I'm more awake, but the caffeine itself is not nearly that fast acting. Krissy:	Correct, yeah. And it depends on the form. You can take caffeine in liquid form, like coffee, you can take it in pill, you can take it in powder, if it was on your pre-workout, so the form will affect that a little bit, but you're looking at 30 to 60 minutes for it to hit its peak. Not to say you won't feel an effect, people get thrown off by that. When I tell people don't take your pre-workout or don't have your coffee right before you go to the gym, or right before you want to start to feel the effects, well I feel something immediate. Okay, well there's probably other things that ... You're just starting to feel more awake. You might start to feel small effects within 15, 20 minutes. But you're looking at the peak effects? 30 to 60 minutes depending on how you're taking it. Nick:	Right, yeah. Is that really different for ... Say you take a little shot of espresso or you have, I don't know, a Mountain Dew, versus taking caffeine in a powder form mixed with water? Krissy:	Yeah, so anything in that liquid form would be the same. A capsule form might take a little bit longer just because your body has to dissolve the capsule, right? And then it has to get into the blood stream. But as far as anything like liquid form, so whether it's a power dissolved into a liquid, or just a coffee, that's about, I would say on average between like 45 and 60 minutes, for it to hit its peak values in the blood. Peak values. Nick:	Meaning at that point, okay, you are feeling the most energy benefits from it. Krissy:	The most energy benefits. Nick:	What else is happening in your body in response to the caffeine? Krissy:	Pooping? Yeah. But it can affect your metabolism. And that's why, if you look at popular and successful, weight loss pills, powders, whatever, they have caffeine or a form of caffeine in it. Because it can increase your resting metabolic rate, it can help you even at rest, burn more calories. And again, this is ... It can be different forms of caffeine. So like, green tea, and we can get into that in a little bit, but green tea extract, which does have caffeine in it, can help to boost metabolism. But it can also, caffeine specifically, if you use it before you work out, caffeine can actually help you use fat, burn fat, rather than carbs while you work out. So again, in a pre-workout or if you take a fat burner before you work out, 30 to 60 minutes before you work out, your body is primed to use more of your fat than your carbs as a fuel source when you work out. So another use for caffeine or any source of caffeine is weight loss. Nick:	Okay, because it could be easy to look at a fat burning product and say, "Oh it's just a bunch of caffeine, they put that in there so you feel like you're burning fat." But is caffeine the most beneficial in a thing fat burner, generally? Krissy:	Most beneficial thing, yes. Nick:	Most science backed, at least? Krissy:	And I don't want to say, non-stim ... And when I say non stim or non-stimulant base, I am talking about it doesn't have caffeine. Caffeine is a stimulant, and it's the most well-known stimulant and that's what we're talking about. So when I talk about a non-stimulant based fat burner, I'm talking about a fat burner that doesn't have caffeine in it. And I just say, don't waste your money on it, or don't rely on it as your primary thing. If you are serious and you really want something that's gonna get you to have any sort of noticeable effects, have one that has caffeine or green tea extract, for the same reasons that green tea extract has caffeine in it. And those are your two best, and the research supports it. Now keep in mind, and I'll do my disclaimer, you have to follow a reduced calorie diet and you have to work out if you want to see fat loss, blah blah blah. Nick:	And sleeping, sleeping can actually help too, sometimes. Krissy:	Right, I mean, it's the whole thing. You've gotta have it all in order. I think if you are gonna go the fat burner route, pick one that has caffeine or some source of caffeine in it to get the most benefit out of it. Nick:	And speaking of sleep a little bit, obviously some people are more sensitive than others. You can take caffeine at night. Krissy:	Yeah, I can have a cup of coffee right before I go to bed. Nick:	I can't have caffeine after about 11 in the morning, or else I feel like it ... I'm a little bit more of a responder. But what is the general window, you call it half-life, or the ... How long is caffeine in your system? Krissy:	Okay yeah, so you brought up half-life. Half-life is a term we use in science and research, and half-life can be, we can relate that to anything that you ingest or that we measure the level, the peak level. So we talked about it takes 30 to 60 minutes to hit peak, and we talked about half-life, we're talking about the time it takes for half of whatever you took, or whatever you're measuring to drop down by half. So let's just throw a number in, we say we measured 100 milligrams of caffeine in your blood, and then we tracked how long it took to get to 50. That time is your half-life, and on average, for caffeine, that could be anywhere between four to six hours. So from where it hit peak, to then where it's half of that, takes about four to six hours for caffeine. Nick:	Oh okay. So it's still in your system at that point. Nick:	I am, I think that's totally fascinating. You go get a little unflavored vape and then you can drink coffee all day, right? Krissy:	I'm not promoting that, but yeah, so it's crazy. Nicotine actually influences an enzyme in your liver that breaks down caffeine. And it creates, or it stimulates that enzyme at a higher rate so that caffeine is broken down much faster. Nick:	You mentioned body size as well, how does that affect the half-life? Krissy:	So, excuse me. A lot of our ... Let me try to think of the easiest way to put this, a lot of our dosing recommendations and how we see the effects of caffeine are all based on body weight, although we generally give across the board, two to 300 milligrams, or whatever. But it is very much based on body weight, so because of the enzymes, and there are multiple ones, they're not just ones that are found in the liver, there are other ones too. So depending on the body size, so a larger individual could probably break down and metabolize caffeine at a much faster rate than a smaller individual, given the same amount. Now if you made it relative to their body weight, that's probably going to change, if that makes sense. So if I gave a relative dose, meaning I said, "Everyone's gonna take six milligrams per pound," which would be extremely high, six milligrams per pound of body weight, that now becomes a relative measure and it would make it more equal across all groups. But if I said, everyone takes two to 300 milligrams, larger individuals are probably gonna be able to metabolize and break that down much faster, and then the effects are going to not be as noticeable for an extended period of time. Nick:	Okay, so is that something that, if someone is taking a pre-workout, specifically, like all right, I know I like to work out with a pre-workout, that they should take into account when they are actually dosing it? Nick:	It's entirely possible to be a large individual who is still highly sensitive. Nick:	Coming down and using sleep, I imagine, is a pretty good measure of that. Like, I can't sleep, hmm, maybe is it ... Okay. Nick:	Is there anything else that you can do aside from that? Or is it just like, I feel nervous, just pure symptomatic like that, in terms of gauging your sensitivity to caffeine. Krissy:	So, yeah. So, looking at people who consume too much or if you've gone too high, gone overboard, symptoms could be jitteriness, your hands are shaking, sometimes your eyes, you've got twitching. Nick:	It feels like my eyes of popping out of my head when I have too much, like there actually, there's electricity in my eyeballs. Krissy:	Yeah, yeah. People will tell me that too. Do you see that twitch? Do you see that twitch? I'm like, how much coffee have you had, caffeine have you had? Nausea will be another one. I actually encountered that in undergrad. I, uh … Gosh, I don't even know how much caffeine ... And I'll talk about, to follow up, the higher limits of what most would recommend, so remind me to hit on that. But I am pretty sure I was well over that and I've never been so sick in my life before, as far as being so nauseous. And I laid down and everything was spinning, and it was just, it was a lot to handle. And when I looked back at how much ... I mean, between Diet Coke and energy drinks and an entire 12 pot thing of coffee, and it was just so much and so much, because I was cramming for exams and you do horrible things to your body at that time. So yeah, nausea's another one, we talk about coffee or caffeine helping to keep you regular, too much of it can actually cause you to be constipated, so there's a lot of things. Insomnia, having trouble sleeping, or having problems staying asleep, falling asleep. There's a lot of things that you could look at, far as maybe I've been having too much, maybe I need to stop. Like, for you it's 11, for me I could probably have my last dose of caffeine, around 100, 150 milligrams around six PM and be okay. If I'm staying up later, which, disclaimer, I go to bed around nine PM so I'll say that. Nick:	As do I, I guess. Back when I was staying up more until 11:30 or 12, I could stop it by two. But yeah, I go to bed while the sun is still up. Krissy:	Yeah, it's awesome. But I do want to hit on, because I get asked this a lot, on how much is too much? We talk about the symptoms of when you've had too much. So lethal amounts, I'm talking about amounts that will, and could potentially kill you, 10 grams. That is a lot, 10 grams. So most of the time we talk about dosing of caffeine, it's in milligrams. So what is that? Nick:	Or yeah, 10,000 milligrams. Krissy:	Yeah, or of 10 grams? Yeah, sometimes I question how I have a Ph.D., I'm trying to calculate that in my head. Nick:	But that would be in like an anhydrous powder? Krissy:	That's in caffeine in any form in one day. Krissy:	In one day, is 10 grams of caffeine. Nick:	I feel like I've heard news reports about people dying from far less than that in a single shot. Nick:	One of our colleagues here. Krissy:	Yeah, yeah … how is this going to throw me off for the day? Nick:	That person could he mindlessly consuming caffeine. Chris actually, our colleague, asked me a question the other day about that, though. He said, I'm one of those people who can take caffeine right up until I go to bed, pretty much. And I sleep, but am I doing damage to myself without realizing it? And doing damage to my sleep, like is it ... Even if you have that incredible tolerance, the caffeine is still in you. Is it damaging your sleep quality potentially? Nick:	Ask your FitBit, I guess. Krissy:	Yeah, yeah. If you have someone who shares the bed with you, are you waking them up every five minutes because you can't fall asleep? But if you're not having any problems with any of that, if you're like me who once I lay down, I am out, nothing will wake me up. Unless it's my alarm clock. I sleep hard, and it doesn't matter if I have caffeine or not. A lot of that has to do with the tolerance of it. So, there are a lot of acute effects to caffeine. Increases blood pressure, increases heart rate, we know that it has an effect on performance, exercise performance. The more you take it, the lower those things, the lower those changes, the acute changes are observed. So people will say, oh well, caffeine raises your blood pressure, caffeine increases your heart rate. That's true, in the very short term. But long term studies, studies that have given people caffeine day after day after day show that it is incredibly safe, in the recommended doses which we've just talked about, and actually has no effect on resting heart rate, resting blood pressure. I, myself, again take caffeine every single day and I have extremely low blood pressure, extremely low heart rate, and I take caffeine as part of my medication for my migraines, which we'll talk about special populations who might benefit from caffeine. But your body does become adapted and does become more tolerated. So someone like Chris, his body's just become so tolerated, he can very well easily take caffeine right before he goes to bed and sleep perfectly, and not have any sort of issues. Your body just becomes tolerant to it. Krissy:	Yeah, so that's the other problem, is once you become tolerant to it and you start to see less performance effects, you start to take a fat burner. And we tell people to cycle their fat burners, because you're on a fat burner for 4-6 weeks, your body starts to get used to it, you're not gonna see that same increase in fat oxidation or use of fat. You may not see that same increase in metabolic rates so we say cycle off of it. If you want to cycle off of caffeine, that is not fun. That's full on withdrawal symptoms, because the World Health Organization looks at caffeine. It's a drug and it's a stimulant and it's an addictive drug, they view it as an addictive drug. So when you come off of it, it's like other drugs. When you take it away from you, you have and experience withdrawal effects. They're the worst one to two days without it, and they linger on for about seven days, but most will say after about a week of it your body starts to adapt with it, without it, excuse me. And then if you want to reintroduce it after that, like after a couple weeks, you can start to then go back to what it was like the first few times you had, it if that makes sense. Krissy:	So if you want to go back to feeling the full effects of caffeine, you should cycle off of it for a week or two before you come back on. Nick:	Every what? Like six months to a year? Nick:	I was gonna say, "When's the last time you took your own advice here?" Krissy:	Well I won't because I suffer from chronic migraines, and for me, I use it as part of my medication. And I'm not saying that you need to cycle off of caffeine, but if you are using it for performance, or you're using it for fat loss, or if you are starting to feel too much of the negative side effects from it, like I said insomnia and things like that. And you've already tailored back, you've pulled back and it's still not helping, then I would suggest cycling off. So yeah, I would say anywhere from two to three months, you could cycle every two to three months, you could cycle every six months, it just kind of really depends on your goals that you want with it. Nick:	Well if your goal is saving money on pre-workouts that might help a little bit, right? Because we hear about people who are just habitual two and three scoop users. We see them on our website, we hear them talk about it here like, "Oh yeah, that one? That's 350 milligrams, I take two scoops of that." Nick:	Yeah, yeah. Let's talk about what actual benefits that person is getting from this, aside from the actual question of dependency, which is a larger question. What are the performance benefits to somebody in the gym? And at what point do they stop? If you take too much, like ... If you can handle it, if you're like, oh I can handle 500, I can take that ... What is it? Mr. Hyde, the most caffeinated pre-workout, I can handle that. Is there any upper threshold where all of a sudden all of the benefits go away. Krissy:	So surprisingly most of the research looking at caffeine and performance, and I will say that a lot of the studies looking at performance benefits with caffeine use caffeine anhydrous, so they use a synthetic version, most common just because it's easy to create that in a lab. You could use a natural form, but a lot of them don't necessarily use coffee. So it's usually caffeine anhydrous, which is why you see that in a lot of supplements. There's nothing wrong with that, and in fact when you want to relate that and translate that to what the research has shown, there's a direct line there. That's what the research used, that's what's in your product, so you can be a little bit better about, okay, I'm taking the right thing. Krissy:	So most of the research uses … that’s hard to say for me. Most of the research has used high doses, and again they use it based on body weight. Most of the beneficial effects occur between 3 and 6 milligrams per kilogram, so off the top of my head, for a 70 kg reference male, which is pretty light I would say, that's about 150, 160? Okay. But you're looking at around 400, to 400 milligrams of caffeine. Nick:	That’s 160. As the upper limit? Krissy:	As the upper limit. Krissy:	That's where they see performance benefits. So when we see pre-workouts that say 300 milligrams, for me I don't need that much, I'm also not 160, 170 pound male, so again base it off your body size. And this is a lot of trial and error, I've tried plenty of different combinations and dosing strategies. But that's what they've used, higher doses. But that's kind of the higher end, anything over that they haven't noticed any additional performance benefits. Where the performance benefits comes in, a lot of time more endurance-based activities because of it’s effects on the central nervous system in masking fatigue. So we go back to where we started this podcast, is caffeine's effect on the central nervous system. It can help to delay, or excuse me ... Well, yeah, delay fatigue by masking fatigue. So it almost hides it from you so you can keep going longer. So people will take it maybe for a workout, it's not necessarily gonna help you. And the research is pretty mixed on whether it can help you push out a few more reps or load up the bar and set a PR on your bench press? Maybe not so, but can I finish my workout with the same energy that I started, or can I finish my last set feeling good? Probably more so. That's the kind of effect you're going to see in the weight room. Krissy:	Training more volume, circuit training, things like that where fatigue plays more a role in it. Now if you're taking it just to feel more awake, then absolutely, you'll get that benefit. But where you don't see a whole lot of benefits, the results are pretty mixed in studies, is if you're doing like a 1RM test. You take caffeine right before, probably not gonna do a whole lot there because caffeine doesn't have a direct effect on the contraction of your muscles, they're not gonna make your muscles contract more powerfully or stronger so that you can lift more weight. For endurance athletes, again, because it helps to allow your body to use fat as a fuel source, think about any long distance event, right? We always want to tap into fuel sources that we have a lot of, and that's fat. We want to preserve carbs so anything that's longer distance would benefit from caffeine as well. Nick:	Does it do anything to blood flow or anything like that? Or … You look a pre-workout, there are a lot of blood flow-boosting agents in there already, can caffeine be considered one of them? Krissy:	Actually, caffeine a lot of times is used ... Well, and it has a couple different effects. It does increase blood flow to the skin, not necessarily does it increase dehydration, and they've shown that caffeine, at moderate doses, does not influence rates of dehydration during endurance activity. Nick:	Yeah, that was another question we were gonna ask, yeah. Krissy:	But a lot of times people take caffeine and I'll relate back to people who suffer from headaches. We take it because it vasoconstricts blood flow, especially to our brain, which sounds bad because you're like, why would you cut off blood flow to your brain? Headaches are caused by an increase in blood flow in cerebral arteries, so arteries that are in your brain, so it helps to reduce the blood flow there. Yes, you will have a later effect of blood flow increase, a small effect of dilation, but that's not one of the primary mechanisms of caffeine. We go back to the acute effects of caffeine that I mentioned before, which was also an increase in blood pressure, because it constricts blood vessels. So there are other things in pre-workouts that will give you that immediate pump, that immediate blood flow boost, all of your NO boosters (nitric oxide boosters), that's responsible for that. Krissy:	Asthmatics might take it too, and you might see it because of the airways, it helps to open up or vasodilate the airways that help you breathe better, so asthmatics might benefit from that during exercise. Nick:	Now when you look at pills that contain caffeine or powders that contain caffeine, you don't just see caffeine anhydrous though. You see a lot of different things on labels these days and supplements. Everything from natural caffeine, whatever that is, to dicaffeine malate, PureCaf, green tea extract, green coffee extract—how do we parse those out? Is there any significant difference in them? Krissy:	Okay yeah, there is. Caffeine anhydrous, that is your most pure form of caffeine. So you look at that, you can say that amount of caffeine anhydrous, up to 99% of it is caffeine, pure caffeine. It's your strongest source of caffeine. Everything after that, the actual percentage of pure caffeine starts to come down. But it can be altered a little bit. So we'll go to coffee or PureCaf, or coffee bean or green coffee bean, those are all kind of grouped together as coming from the actual coffee bean. There's a lot of things that can affect the percent of caffeine that's in there, the potency of that caffeine. Roasting, that's always a fun one to talk about. And people would say, the longer that it's roasted, the darker that it's roasted, it decreases the caffeine to a very small extent, but I wouldn't look at roasting too much. It more has to do with the type of coffee bean, how well it's, fine it's grinded down, how it's made, certain things like that. Or brewed, not made, but brewed, more things affect that. So yeah, PureCaf, green coffee bean, coffee in itself, those, depending on how it's made, can range from 10% coffee to much higher percentages. Krissy:	Oh, sorry yeah, caffeine to much higher percentages, 70%, again, it all depends on how it's made. Nick:	Oh okay, so if you have any doubt then choose something that actually says how much caffeine is in that? Nick:	Along with that, that category alone where it's saying, it has this many milligrams of green coffee bean extract doesn't tell you anything about how much caffeine is in there necessarily. Krissy:	Right. And a good example of that is when you buy something with green tea extract, it should always say how much caffeine is in that. Because it might say 175 milligrams of green tea extract, that's how much caffeine is in that. Because green tea extract is not a high amount, maybe 15%, let's say of caffeine. So it should say on the label how much caffeine is in that product, because it does carry some caffeine, but not equal to the amount of the actual green tea. There's other compounds in green tea, EGCG and other things like that, compounds that have effects that you've gotta account for. Nick:	And it's worth noting that that also applies to any caffeine product that you buy any place too, there's no predictable way, as you kind of mentioned with roasting, to predict that. I was looking at, there's a website called Caffeine Informer, I believe it was called, that lists caffeine amounts in every conceivable beverage that ... Not of course your little local coffee shop, but all the big ones. And Starbucks for instance, their darkest roast coffee is their highest caffeine and supposedly it's made with 100% arabica, which is the lowest caffeine bean. So there's like ... Everything on the label, except the actual number, says this should be a relatively low caffeine cup of coffee, but on the contrary it's very high. How do they do that? Well, it's a mystery. One coffee roaster once told me, well clearly they add a bunch of caffeine to it. Krissy:	And that goes back to how it was actually made. Nick:	But they may or may not, whatever it is, you don't know. Krissy:	You can add caffeine, or the way that it's formulated and made or produced, you can concentrate the caffeine to a higher level. Nick:	And even decaf does have, right? Krissy:	Yeah, so I believe it's FDA requires that is be 97% caffeine free. Krissy:	So you can find caffeine in decaf. Nick:	Okay, so let's go to a couple other questions. I've been opening it up to people in the company for their caffeine and caffeine in training related questions. Nick:	One person wanted to know, does adding milk to your caffeine, to your coffee, to your milk, affect the absorption or anything about the caffeine. Nick:	Slow it down, not eliminate it? Krissy:	Not eliminate it, just slow it down. Nick:	It does add volume, all those things add volume to the drink, which might make you absorb it more slowly. Krissy:	Yep. And that was something that I read that brought it up, is that it causes you drink it slower a lot of times, is because there's calories in it too, so if you're concerned about that. But as far as the caffeine or the antioxidant potential of drinking coffee, it has no effect on it. Nick:	What about, “caffeine makes me less drunk?” If I mix the two of them? Nick:	But many, many people do that, right? But does it actually make you less drunk at all? Krissy:	No, caffeine has no influence on the effects of alcohol. So the whole upper and downer thing, and the effects of your body absorbing that, no, nope. Nick:	So if it makes you feel less drunk, maybe that is a bad thing? Krissy:	Yeah, and that's why ... Well, that's why companies ... What, Four Loko? Yeah, that's why they had to pull those things and the other companies too that were putting caffeine in alcohol. It's getting cracked down on and not seen as a good thing, because it's misleading for the body. I mean, people will Red Bull and vodka and things like that, which, never a good night ended with that. Nick:	What about caffeine during pregnancy? Is it safe for a pregnant woman to drink caffeine? Or a breastfeeding woman? Nick:	I mean, and I guess the way you gauge that with a baby a lot of times is that they're not sleeping, so it'd be hard to tell is it because they're actually getting stimulated by the coffee? Or is it their stomach's upset? Yeah, I will say that when my wife had coffee and was breastfeeding that was 'no bueno' for my son, in that he just would not sleep after that. Krissy:	Right, right. And so you learn, say okay, no, not doing it. Nick:	Okay. Is it worth having a caffeination strategy for a specific event? Do elite athletes, elite lifters, anybody like that peak their caffeine usage? Or is that something that somebody should even consider? Nick:	Two to three hour spacing? Is that something we could apply to our daily lives? Those of us who actually do it too, as opposed to oh, just take a cup every hour, cup every hour, and it's actually not doing that much. If you just said, you know what? I'm gonna have a cup of coffee every two hours, every three hours, would you get the same effect? Krissy:	Now let's say you've only had 50 to 60 milligrams, or you just had one cup, and I've only had 80 to 100 milligrams, I probably haven't hit that upper limit to what I would probably get my best benefit. So for me, I would say usually around two to 300 milligrams. So in the morning as I'm getting started I'll have a few cups of coffee within my first two hours of being here, and then I back off, and then I have something in the afternoon, if that makes sense. So when I talked about my morning ritual, I'm heavy in the morning and then I'm back at it again before I teach my evening classes. So I have that period of time in the day where I've hit my peak and so now I kind of come down, and then I hit one more time before the evening, before I teach again. Nick:	Um, people are taking more caffeine at younger ages than ever too, I saw something really interesting recently about the amount of coffee that young people are drinking, and aside from things like energy drinks, anything else. Is there any risk about stunting growth from caffeine usage? That's something that has been tossed around for a long time. Krissy:	Yeah, no, so if you look at ... Growth is really about length of bones, and caffeine has no effect on bone plates, growth plates. Other things can affect that. Now I guess if you had high, high, high levels of caffeine, if you were not having a diet that was adequate in calcium, magnesium, vitamin D, if you were not getting enough physical activity, I mean there was other things that were minimizing bone growth. Krissy:	And because you were just consuming a bunch of caffeine ... There's a lot of ifs, ands, or buts that you could say, well maybe, high level of caffeine would do that. But it would be a stretch to say that, which is a stretch for stunting your growth. Nick:	It’s unlikely. What about somebody who's just trying to add muscle and takes a lot of caffeine? Okay, we've established that caffeine helps to burn calories, is that something that they need to worry about? Because they want to put every calorie to good use. Nick:	200 calories is pretty easy to eat. Nick:	About age 15 I just decided, I was like, you know what? Black coffee's the cheapest, that's what we're gonna start drinking guys, now we started drinking. Krissy:	That's why I started drinking it, I was like, "I can't even afford milk in college, so I'm gonna drink black coffee, that's all I can get." Nick:	Okay. I we hear a lot about the health benefits of coffee, okay, for different cancers, Alzheimer's, all these different things. Is that a compelling reason for somebody to drink caffeinated coffee? Is there anything in the caffeinated version versus saying, "Hey, you know what? I drink decaf like my grandmother does." And I'll have my cup of decaf and pretend that it's caffeinated. Krissy:	Yeah, that's a great question. First, on that, caffeine hasn't been shown ... Okay, I'm gonna switch now to say coffee. Most of these studies are done with coffee, not necessarily caffeine, so coffee. And none of them are going to reduce the symptoms or, once you have said disease, will it reduce or reverse the disease. So if I have type two diabetes and then all of the sudden I start drinking cups and cups of coffee? Am I going to reverse type two diabetes? No study has shown that. But there are numerous studies and everything that you just said, type two diabetes, certain forms of cancer, Parkinson's disease, that coffee consumption lowers the incidence or it lowers the risk for said diseases. So, I think if it is something that's part of your diet, I think continue to drink it. Now if you don't like coffee, you can do other things. The reason why coffee is seen as beneficial in those, because certain compounds, chlorogenic compounds that are found in coffee, that are also found in decaffeinated coffee. And there was actually a study that looked at both caffeinated and decaffeinated coffee for type 2 diabetics and found the incidence rate or the risk for type 2 diabetics was the same whether you drank ... Was reduced the same, whether you drank caffeinated or decaf. So it's more about the chlorogenic compounds which are anti-inflammatory. There's a lot of things that are anti-inflammatory these days that we can take. So if you hate coffee, don't drink it just because you're like, "Oh, it will help this." Because you've got to drink a lot to see those benefits. Nick:	Right, the Alzheimer's study's was a ton of coffee. Krissy:	So you're talking like six to eight cups of coffee. For me, I'm like great, I'm gonna do awesome. Nick:	I'm gonna live forever. Krissy:	I'm never dying. But if someone hates coffee, you can find those things other places. You can have antioxidants are in fruits and vegetables, anti-inflammatories you can take ... Fish oil is anti-inflammatory. There's so many other things that we can talk about but yeah. That's what I tell people, don't fear that it's gonna cause you to die earlier or that it's horrible, quite the contrary, coffee consumption is potentially beneficial for preventing a lot of these chronic diseases. Nick:	Okay. 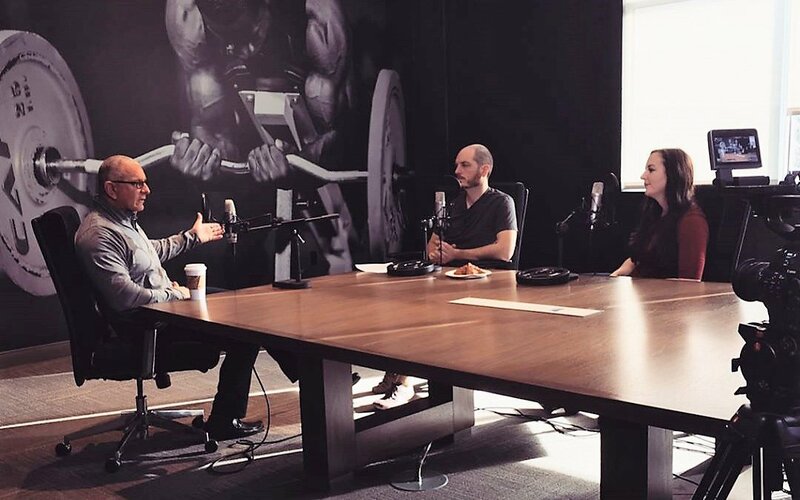 It's worth noting that this has been a very coffee-centric conversation so far because we get free coffee in this office, but also because we are Americans where coffee is a little bit more fundamental, whereas Kris Gethin, Robert Irvine, some of our guests on the podcast, they don't like coffee. They're like, "We're tea drinkers." Is there anything in black tea, green tea, that throws a wrench in everything we've said so far about caffeine? Krissy:	No, it just depends on the type of tea. So black tea compared to green tea, black tea has more caffeine than green tea. But when you talk about the antioxidant effects of tea, green tea is higher than black tea. So it just depends on what the benefit you want from it. They tend to be less caffeinated than, let's say your standard cup of coffee, but there's nothing wrong with getting your caffeine from tea. Nick:	Okay. It also has the theanine in it right? Krissy:	It has theanine in it. Nick:	I find that I can drink green tea all day, pretty much and not have any of the sleep impingement. Krissy:	Yeah, you bring up a good point. So theanine actually ... And it's being used in more products now, supplements, in combination with caffeine because it has a similar effect to caffeine. It helps mental acuity, it helps with alertness, but without the negative side effects of caffeine. And it actually has been shown to reduce tolerance to caffeine. So a lot of people like to take it because, or combine it with caffeine, and you see it in products combined with caffeine, or maybe you see TeaCrine®, which is a trademarked version of L-theanine, it's the same thing it's just the compound. You combine it with caffeine so you get the ... This is how I say it, you get all the good stuff of caffeine, all the stuff that you want without all the bad stuff. The jitteriness, trouble sleeping, fast heart rate, shaky, whatever it may be. So you get all the good without the bad because of L-theanine, so it basically milds it out. Nick:	That's interesting, okay. So somebody could potentially just take ... Is L-theanine something you could just take as a supplement as well? Krissy:	You could take it on its own, but it works best with caffeine. Nick:	Toss one back with your coffee? Make your own green tea version? Krissy:	Yeah. On its own, you ... Well, it goes back to what the effect you want to see. On its own, you're not gonna have that alertness, like, "Okay, I'm ready to take on the day, or ready to do this." If you want more a calming effect in your brain, like you just want to soothe everything then just take L-theanine on its own, and maybe that's why you see it more in teas or marketed in teas or sleepy time teas and things like that, it's more of calming, which is how it helps to balance out caffeine with it's combined. Nick:	Okay. I think we've covered a fair amount of caffeine area here. If there's anything else that anybody wants us to address in the future, we're more than happy to do a follow up podcast, yeah exactly. Krissy:	Yeah, get another cup of coffee. Nick Collias:	Toss it in the questions and we'll see if we can gather enough up to do another one of these. Thank you very much for talking about this, Krissy Kendall. Krissy Kendall, Ph.D.:	Thank you. Get the scoop on how caffeine, the world's most popular stimulant, can jack up your workout without keeping you up!